The learning commons is a dynamic, student-centric space designed to accommodate multiple learning activities and facilitate both quiet, individual study and collaborative conversations. It demands flexibility in order to meet the evolving needs of students, allowing them to meet, talk, study, create, and use technology and other resources. A welcoming learning commons with special spaces has great potential to influence individuals and society in a positive way. Read on to discover 4 elements of a learning commons and learn how to incorporate them to transform your library. Students are the owners of the learning commons. Forming a user advisory board is a good way to communicate and generate ideas about how students want to use their space. In remodeling our own school library to be a learning commons, we asked students to vote on their favorite cabinet and countertop materials. 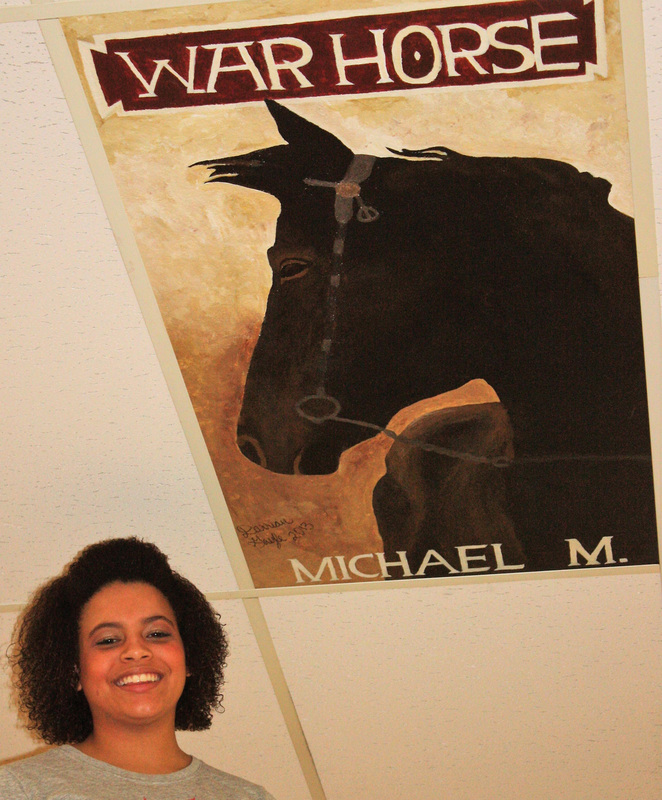 Book club members decided the paint color, and advanced art students painted ceiling tiles to look like book covers. We also added soft seating. Students have access to a kitchenette with a microwave, refrigerator and sink and can purchase drinks and earbuds. 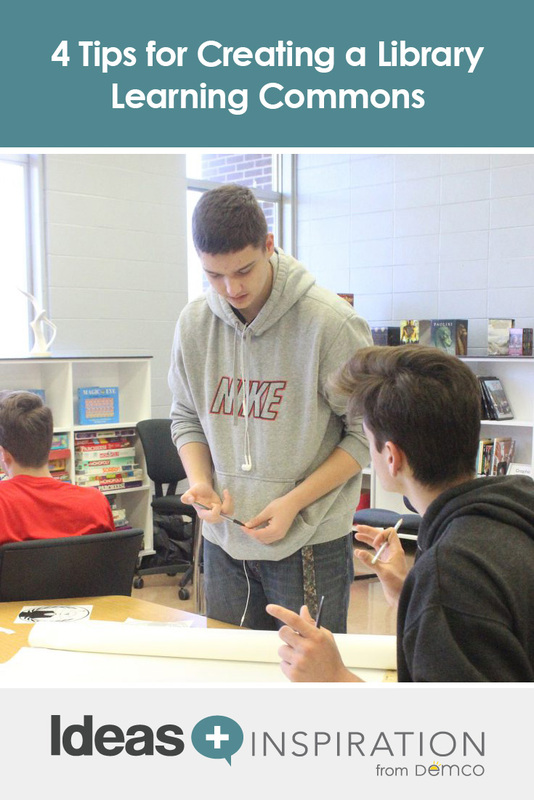 The learning commons is open before and after school for students to bring breakfast, receive tutoring and work on projects, homework or creations in the makerspace. 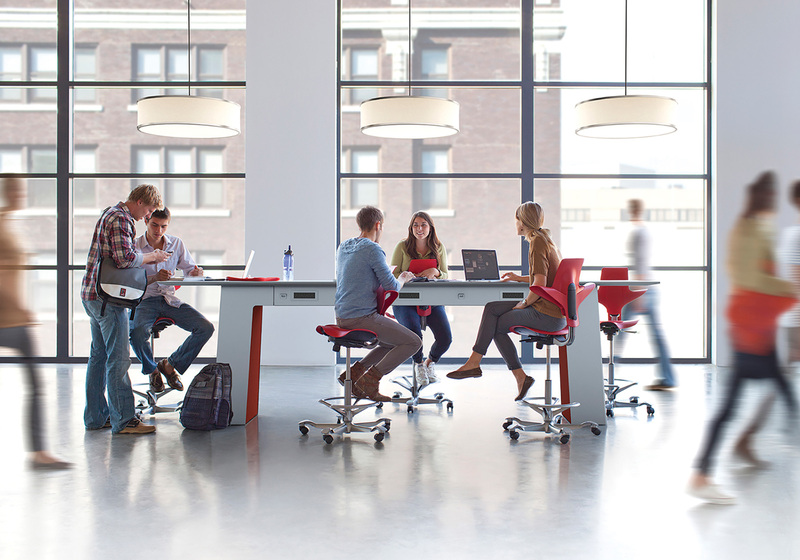 Your learning commons should be a flexible physical space. 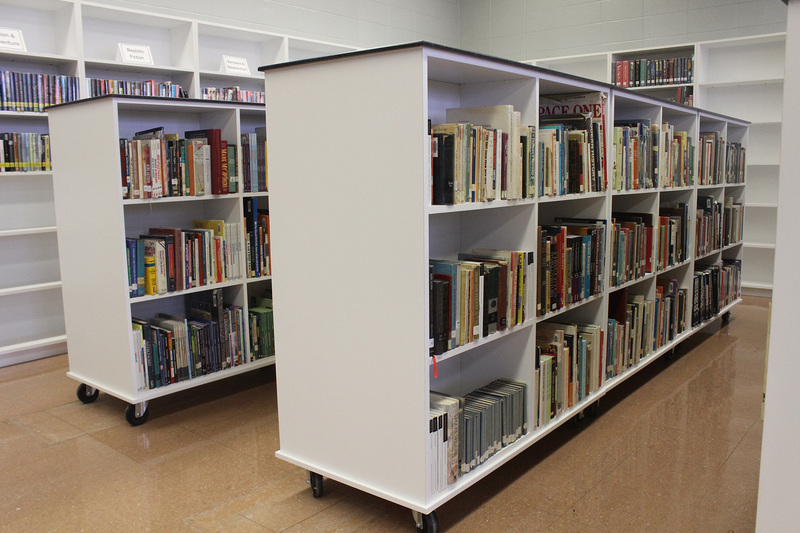 Making shelving mobile greatly increases the ability to adapt to changing needs and activities. Shorter shelves on wheels make a small space flexible to accommodate book club meetings, author visits, community meetings, book fairs open to the public, etc. Shorter shelving also creates more visibility and openness, providing space for book displays. Although ADA accessibility guidelines do not restrict shelving height, shorter shelving certainly allows for better access for those in wheelchairs. 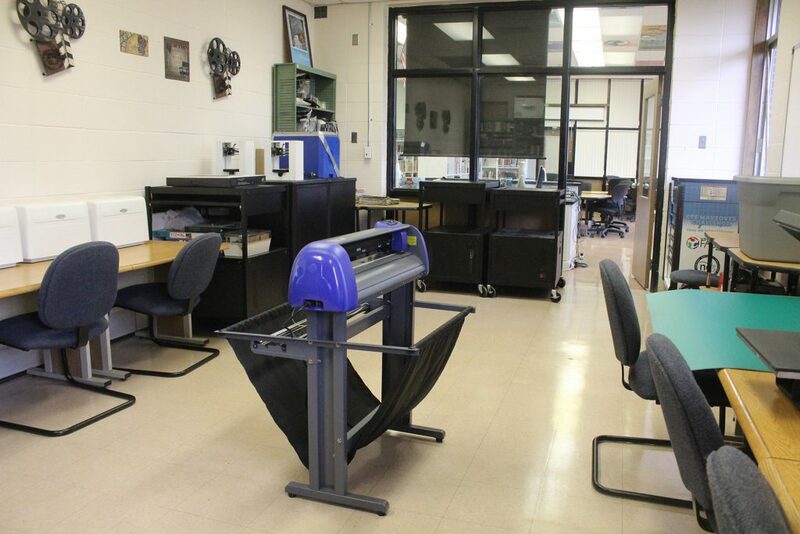 Purchasing mobile and/or stackable furniture enables quick rearrangement to meet learning needs. Students in one library near Kansas City enjoy use of a mobile node desk chair. Students can move directly from small group seating to a large group circle or even classroom rows. Keeping the space flexible also means featuring flexible technology. Replacing desktop computers with laptops permits students to move to a comfortable sofa or gather around a table for collaboration. Depending on house rules, students may even be allowed to check out a laptop to take outside the doors of the learning commons. In the transformation from library to learning commons, be careful not to change or throw out too much. One caution when arranging spaces is to be sure to create pockets or zones for students to work quietly, as well as areas where groups can work on projects. A good weeding might also be desired to freshen up the book collection, but it’s not necessary to get rid of all print resources to replace them with digital options. A good learning commons accommodates all types of learners. Browse the products that work best for collaboration, social learning and individual study in the Library as Learning Commons Idea Gallery. 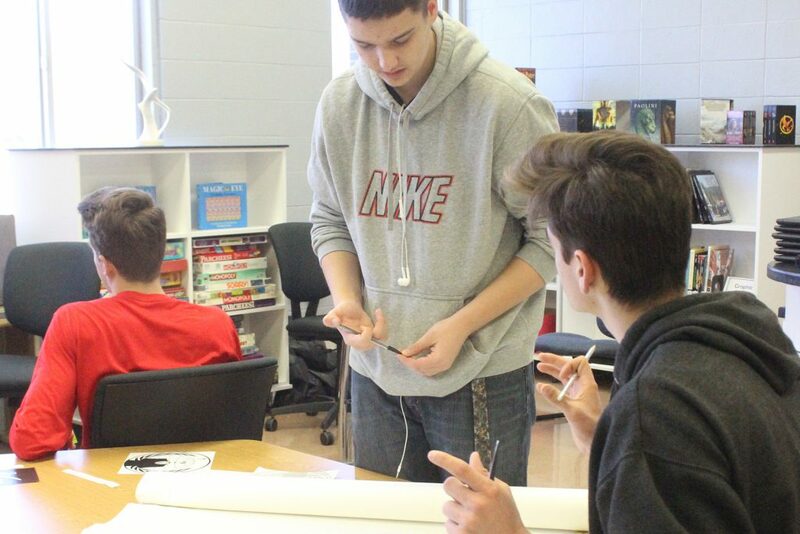 The learning commons is receptive to an abundance of activities directed by student needs. Along with the traditional research and homework assignments, here are some of the enterprises taking place in my own high school learning commons, demonstrating just a fraction of the possibilities. Find ways to increase and ensure physical and virtual access. Making the learning commons available 24/7 isn’t as hard as it may seem at first. If at all possible, let your students help determine the hours of physical operation. Blog/Website: Start with a website where your online catalog, ebooks and databases can be accessed at all times. Provide information that parents and community members want to know. Showcase photos of students and their activities. YouTube Channel: Creating a YouTube Channel provides a venue for promoting the innovation happening within the learning commons. Social Media (Facebook, Twitter, Snapchat, Instagram): Teens use social media to express themselves and find information. Find out which platforms your students use to connect. Most use more than one social media site and use differs by gender, so consider multiple methods to reach your patrons. You’ll also want to put a generous amount of thought into the development of your “brand” before creating social media accounts and a domain name for your website. Search for a unique name that you will be able to use across all platforms. Your patrons will become familiar with who you are and will have easier access if they can search for your brand. No two learning commons will look the same. Even the same one will evolve over time as users’ needs change. Seek out resources and examples and adapt what others are doing to develop your own unique learning commons! Mary Bangert is a two-time recipient of the Bright Idea Award, given annually by the Missouri Association of School Librarians (MASL), and has been a presenter at MASL state conferences. 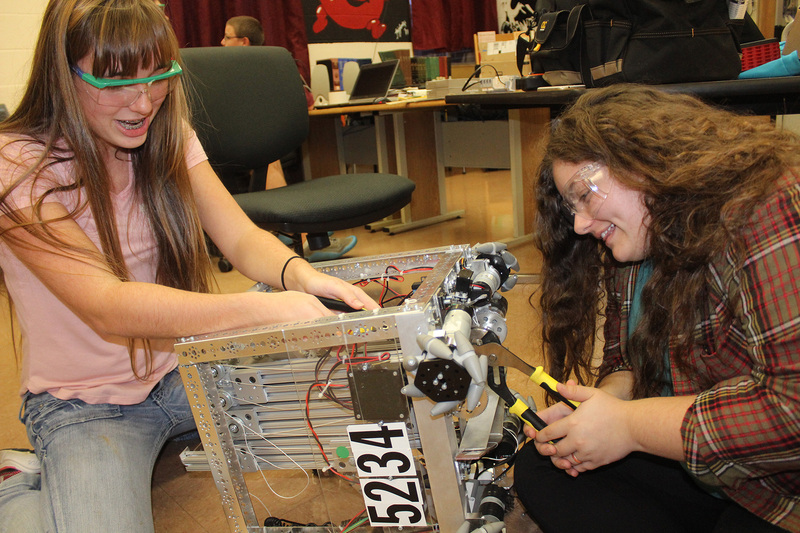 As a high school library media specialist in a small, rural school district, she wears many hats, including yearbook advisor and robotics team administrator. She is a successful grant writer for the school, bringing in over $50,000 in cash and prizes for the 2016–17 school year alone. She received her B.S. in Education from Southeast Missouri State University and a master’s degree in Library and Information Science from the University of Missouri in Columbia.